The state of my mind, "CONFUSION"
I didn't realize what everyone was so crazy about. Going out on 2-3 hour hikes was enough for me. I didn't feel the need to summit a mountain or to hike for 9 consecutive hours. Until one day when my husband hijacked me. He didn't inform me about the goal he had in mind. He knew I would never agree to it. I would be too worried and doubtful of our abilities. Those doubts would stop him from achieving HIS goal. So he kept our destination to himself. We drove along happily on our first vacation without the kids, everything was great. After about an hour into our trip I noticed that we were no longer headed toward our intended destination, Acadia National Park. We had detoured from our path and were heading toward New Hampshire. This got my full attention! I asked, "Where are we going?" His answer, "We are going to Mt. Washington. We don't have to climb the whole thing, we can turn around whenever you want, I promise." Well, we had this discussion two nights earlier with his brother. Eric mentioned traveling to Mt. Washington in the summer since he did not reach the summit in the winter. The brutal winds and altitude kept him from reaching the top. I had listened to details for 5 months about how hard that attempt was. Now he wanted to try to climb it again, with me, and without any serious preparation? My answer was no way!! I have two children and a life I love, I was not ready to end it on the side of that mountain. His brother who also attempted the Mountain that winter and explained how wreckless it would be to just go out there and try it. Fast forward two days and there I was in the car on the way to Mt. Washington, like it or not! Needless to say the next hour or so of the drive was pretty intense. My husband reiterating his great desire to put his failed attempt behind him and to tackle that Mt. After a lot of debate and self counseling, I gave in. Anything that important to Eric is that important to me. Even if my life was in jeopardy. I did not know what to expect but I decided to do it anyway. 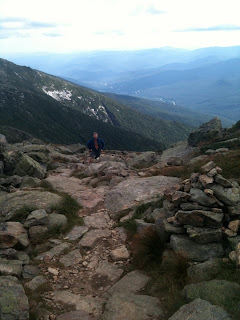 I am a fairly experienced hiker and I do love it, why not push my self to the limit? That simple thought began my massive transformation. I decided that we would tackle this Mt. with all we had. The next morning we set out, got our trail map, and some advice from different people, including the guy who drives the ambulance and rescues people from the same Mt. we were going to climb. He tried to deter us but with our goal in mind, we could not be stopped. After a bit of discussion, we planned our route my favorite kind of hike, a loop. Up one trail, and down another. Things were looking up. The morning of the hike was a beautiful sunny day. We began to prepare our packs and our minds for the trail ahead. Time passed quickly and before we knew it, it was 10:30a.m. and we had a long trail ahead of us. Would the weather hold? Would there be sunlight left for us to find our way down? Did we bring the proper clothing, and what about food and water? Those questions were fleeting. At this point it didn't really matter. We were committed and nothing was going to stop us. As soon as we stepped foot on the trail I realized that this was no ordinary hike. The path was rocky and went straight in and up what seemed to be a waterfall. Was this really the way? There was no way of telling. As the challenge increased so did our excitement and determination. The weather was spectacular and the sights were too beautiful for words. The trail was unbelievable. We went through all of my favorite places, forests, wide open spaces, grassy meadows, and steep rocky climbs. Every muscle in our bodies had to be alert and ready for action. We were lucky to be there and blessed to have the health and desire to want to do something like this. When we encountered other people on the trail they were as excited as we were to be spending their time on that beautiful mountain. The friendly, positive nature of everyone on the trail was inspiring. I thought, what could be better than this? After about 3 1/2 hours we reached the top. This was the best part of the day. Eric was elated! He conquered his goal. The failed attempt from the prior winter released its grip on him. I saw the glory and sense of accomplishment he felt in his eyes. For myself, I had a sense of fulfillment. Not that I thought I was missing anything or needed more, but more like this incredible climb brought out an undiscovered part of me that made me complete. It was a moment I will never forget. After the congratulations and hugs, I glanced beyond my husband's beaming face. I noticed there were many other people with us on the top of the mountain. It was so strange to see so many people. What were they all doing there? We just struggled our way up to the top. We were battered, scratched and bruised, and here relaxing in a pair of Florshiem shoes and a panini in hand were people. Clean people with nice hair and clothes. It was kind of funny and unexpected. I completely forgot that driving to the top of the mountain is the most common way up. I felt like I had a special secret, a real relationship with the mountain that no one else there had. A bit more of an understanding of where we were. I loved that feeling. We spent some time exploring the top, having a delicious cup of coffee, and checking out the gift shop. Of course Eric needed the "I climbed Mt. Washington," t-shirt. Time flew and before we knew it, it was 3:30 and we had a long way down. That's when my husband said something surprising. He said "I just wanted to climb up, we can hitch a ride down". There was no way in hell that was going to happen. He gave in quickly and became reinvigorated. With great excitement, and some nervousness on my part, we headed to Amonoussaf, the trail we were taking down. Well, the way down couldn't be that bad, we had gravity with us, right? Wrong! That trail took us down very steep and rocky paths, straight down a mountain waterfall. The whole trail was wet and slick. This made for quite a slow hike down. The first half of the way down we were on our hands and butts to keep us from falling. Every step pounded our knees, the rocks could be felt through our shoes. Our Florida bodies were not accustom to going downhill. We strained to keep ourselves from falling forward and having our knees buckle. The physical challenge and search for new techniques to maneuver the trail, was exhilarating to our minds. Though our bodies were being strained and our muscles already fatigued we still appreciated the spectacular beauty that surrounded us, but we were also very aware of how insignificant and fragile our bodies were compared to the power of the mountain. Soon we realized that starting our hike late in the morning, proved to be a foolish thing. As we reached the tree line and entered into the forest, the darkness was starting to show. Navigating through the rocky trail had now become more difficult. Holes in the trail, muddy areas, and of course the killer roots that always seemed to grab our boots and want to throw us to the ground found us at every step. As the sun went down more, the shadows grew long. The sites on the way up the mountain were now taking on a new appearance. The large rocks and fallen trees along the trail began to take on life form. Not just any kind of life form, but the black bear kind of life form. But not just the ordinary black bear kind of black bear life form, but the black bear with cub type. Every where we looked on the trail an imaginary mamma bear and cub were waiting for us. We did not even prepare for bears. No spray, no bells, I guess hiking is a continual learning experience. Good thing we had luck on our side. As the darkness consumed us, off in the near distance we heard cars driving on a nearby road. Well, at this point, we new we were at the end of the trail. Excited as we were to get to the end, a bit of sadness overcame us knowing that this spectacular trail was wrapping up. Another 10 more minutes, my husband kept saying. It turned out he said it approximately 15 times. About an hour and a half later, we made the bottom of the trail. It was exciting to be at the end but at the same time I was sad. It was not enough. I wanted more already. I did not want to leave that mountain or that feeling of peace and freedom. The pain in our knees and feet began to pound and reality set in. How could I make this a bigger part of my life? How could I have the ability to share this with my children on a regular basis? These are questions that I would continue to focus on daily but at that moment I needed to know that I could experience another grand hike before we headed back home. I pleaded with Eric to do the Lafayette Loop the following day. He thought I went mad but was taken in by my excitement. Our lives, goals and way of thinking would be slightly different forever more. We were a part of something special and we wanted to share the feeling and the experience. Now we are on a quest to figure out how? To begin this journey I think you should know a little bit about us. My name is Eric and I am in my early 40's. I was born in New York but moved to Florida at the age of 3. My father is a surgeon that studied in Bologna, Italy. While there, he met and married my mom. The combination between a New Yorker and an Italian provided my sister, two brothers and I with an interesting and adventurous childhood. My father, being a young surgeon, worked night and day so my mom stayed home and raised us. Things at home got a little overwhelming at times but it was a great childhood. One of the amazing things my father did for us was to share his love of the outdoors. He made sure to fit in vacations that always had to do with history and outdoor activities. That's where I got the bug for wildlife and the outdoors. As a child in Florida my wilderness was the everglades. At that time the river of grass was vast and pristine. Its beauty and wildlife came right into my backyard (an alligator even ended up in our swimming pool). I spent my days exploring the local wildlife including alligators (which I love) and bass fishing. We also took many trips to Italy to visit my family and travel through the neighboring European countries. My favorite parts of these trips, besides the food, were the trips to the Alps. This ignited my desire for travel and exploration. Other places we traveled to were, North Carolina, Canada, and Colorado. Many of these vacations were ski trips. I have recently discovered that even though I love skiing, it was the surrounding wilderness that was more important to me. It gave me the sense of freedom and peace. I need this freedom in my life. As we got older, my dad took us rock climbing, backpacking, and camping. These were the best. I always enjoyed testing my abilities and learning outdoor skills. When I turned 15, I met a girl of Italian descent. Her name is Marisa. Our backgrounds had two things in common, we were both from Italian families and we both had restaurants in our families. That's where our common ground ended. None the less her physical beauty and more importantly her interior were so incredible that we developed an unbreakable friendship. A never ending love consumed us. We could not be apart. My parents (thank God) also developed an unyielding love for her. She became a part of our family. So much so, that when my parents planned a trip, they purchased a trip for her as well. She went from taking 1-2 family vacations in her life to traveling pretty frequently. These vacations developed her passion and need to travel. Soon college came into the picture (we went our separate ways for a year or so). At this time, playing the drums in a rock and roll band with my brother and friends was my main entertainment. My brother and I stilled continued the act of outdoor exploration by going on backpacking trips in the surrounding areas such as New Hampshire and Massachusettes. It was finally time to mature. I graduated school as a veterinarian and Marisa became a teacher. We always kept in touch during this time. The love we shared never died. So, I did what felt great. Right after graduation (1996) we got married and settled in Florida. Two years later we started a family and have a beautiful boy and girl. Our lifestyle continues to include many vacations and a lot of outdoor activities. The experiences that we have had through the years with our family and friends and the ones we expect to make in the future are ones that we want to share. Short stories are our chosen path to bring them to you. From deciding where to go next, to fulling the adventure. These stories are full of excitement and humor, as well as fear, and hunger pains. But most of all, a sense of pride, of completion, and a heart filled sense of fulfillment. For people like myself, hearing and reading about these adventures gets me excited about the next trip and puts me at ease during the day to day grind of work. It also teaches me outdoor skills that I may lack. Marisa and I thought it would be fun to take our fellow bloggers on this journey from the past to future adventures from beginning to end. We hope this blog will inspire more people to step into the wilderness with us.